I’m not really so much into Halloween lately. It might be because here in the City, people are so terrified to let their children go door to door that instead they go store to store collecting candy. It takes the fun out when you can’t see kids all dressed up and excited coming and going. Which tends to be the attitude when we go collecting candy anyway, right? I remember my mother bought king-sized bars since we at most received 5 kids on Halloween and she wanted to award them for coming out of their way. Before Halloween she would remove some of the handout candy before kids came around and squirrel it away. The candy ended up being ours for the taking eventually. It's the same role my brothers and I took. We would arrive home from a night of Halloween, post egg and shaving cream fights, fears of local cats being skinned and bigger kids driving around with BB guns, and trade our candy between the three of us. We then stealthily (or so we thought) hid our candy in different areas of the house, taking a few pieces out for a daily (or hourly) sugar high, saving the prized pieces, those elusive king sized bars, for last. Some years, we were still eating through our stash into April. Ms. Scarlet and Professor Plum (a la Clue: carry a candlestick, library book, or other Clue-centric items. I think this would also be great for groups to go as all the Clue characters). A few months ago my mother gave D a Madeleine pan. In the meantime we have been searching for the perfect recipe. After much contemplation, we went with one from Gourmet’s Best of Paris cookbook. They turned out fabulously puffy and moist with a great aroma and buttery flavor. I thought they had a slight resemblance to The Bride of Frankenstein so I doctored them up with a little cocoa powder. Makes 2-3 dozen cookies depending on cookie sheet size . Active time= 20 minutes. Inactive time= 40 minutes. 1) Set oven racks in upper and lower thirds of oven and preheat to 350F. Brush molds with melted butter. 2) Sift together flour, baking powder, and salt. Beat eggs in a large bowl with an electric mixer at high speed until light and foamy, about 30 seconds with a standing mixer or 1 minute with a handheld, then beat in vanilla. 3) Gradually add granulated sugar, beating constantly at high speed, and continue to beat until mixture is tripled in volume, about 3 minutes with a standing mixer or 5 minutes with a handheld. 4) Sift flour mixture in 3 or 4 batches over eggs, folding (with a spatula) in each batch until just combined. Then fold in zest and melted butter. 5) Spoon a rounded tablespoon of batter into each mold (about two-thirds full) and bake in upper and lower thirds of oven, switching position of pans halfway through baking, until golden around edges and a tester inserted comes out clean, 10 to 12 minutes total. 6) Invert madeleines onto a rack and dust scalloped sides with confectioners sugar. 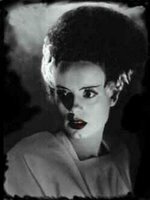 NOTE: to get the Bride of Frankenstein effect cut out a piece of paper the size of a finished cookie. Use a pencil to outline The Bride’s hairline, noting that where you cut out will be darkened and where the paper is left behind will remain cookie-colored. Place cut-out over cookies and dust with cocoa powder. Use red food coloring, red hots or other small candies for eyes. Tags: madeleines, Halloween cookies, cookies. For some, the crisp fall weather is fearsome. It means cold weather, leafless trees, heavy jackets, and buckets of snow are on the way. Too worried about the future, they fail to appreciate the present and all the greatness this time of year has to offer. To them I say, be away with you-- move south! Whatever happened to your love of sledding, apple picking, snowball fights, pumpkin carving, and snow angels? Jumping through billows of fresh fallen leaves or mounds of fresh pure snow? Waking up on a cold morning to icicles covering the windows and pole licking dares (à la A Christmas Story)? Personally, fall is my favorite time of year. I love the brisk weather, the changing of the trees, and bundling up in sweaters and mittens. I especially love the food of the season: hot cocoa, soups, stews, the spices that emerge (nutmeg, cinnamon, peppermint) and the general hearty warming these things have on the state of mind. I go into ration mode. I have the summer fruits I bought overripe and cheap, frozen away to be used in the dead of winter for a Caribbean-like fruit smoothie when its bitterly unbearable outside and reminders of warm weather are necessary. I also have my stockpile of soups that begin to accumulate in single serving sized containers, ready to accompany me to the office for a little internal snuggle or a fast dinner when the need arises. This soup is an exception. Naturally sweet, creamy and delicious, it is hard to put any aside for a later date. A perfect seasonal soup, this dish would look fabulous for a Halloween treat, Thanksgiving feast, or anything in between and beyond. Make this soup, and you may never make another again. Serving Size= 8-10. Active time= about 40 minutes. Inactive time= about 1 hours. 1) Preheat oven to 350F. Using a heavy sharp knife, slice the three squash down the middle vertically. Gut the seeds (set aside if you want to bake them for eating later, otherwise; discard). 2) Place the squash skin side down on a large cookie sheet and place in middle rack of oven. Bake for 40 minutes, or until soft when poked with a fork. 3) While squash are baking, prepare the other ingredients and begin the soup. 4) In a large stock pot on medium-high heat, warm 2 Tablespoons olive oil or butter (or combination of both). Add onion and sauté until translucent; about 8 minutes. 5) Add celery, carrots, chicken broth, rosemary and cinnamon sticks. Cover and bring to a boil. Reduce heat to medium and uncover slightly. The squash should be about done at this time. 6) Remove squash from oven when soft when touched with fork. Using a towel around your hand, or a fork and knife, either peel the skin off the squash, or slice it away, keeping as much meat as possible. Cut squash into 2-3 inch chunks and add to stock pot. 7) Cover and bring to a boil then reduce heat and remove cover. 8) Remove cinnamon sticks and rosemary twigs (leaves will have fallen off). Add nutmeg. Using a handheld blender, or carefully in batches with a regular blender, purée the soup until smooth. 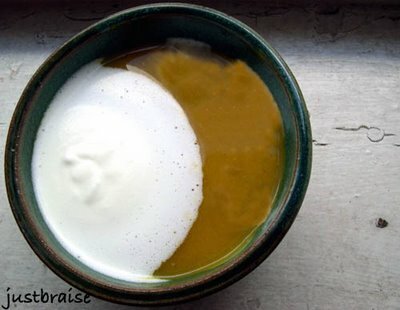 9) Serve plain or with a little heavy cream. *Note: If you are unable to find these squash in your local market, almost any combination of squash will work. Just Acorn and Butternut would work well, or Acorn, Butternut and pumpkin, etc. Tags: squash, soup, squash soup, butternut squash, acorn squash, golden nugget, hearty soup, comfort food, fall flavors. New Orleans Table Event and a Char-Broil Event. Tags: reviews, events, New Orleans, Char Broil. I almost forgot how much I enjoy applesauce as a snack on its own. Sweet, spiced and best of all, warm and fresh. As noted, applesauce makes a great side to pork chops and is great as a side to almost any sandwich. 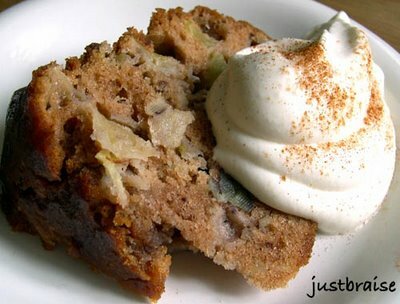 I sometimes throw some applesauce into brownies and cake or pancake batters for some extra flavor and moistness. 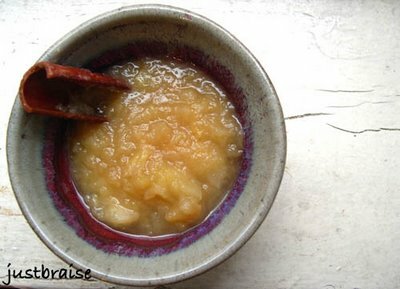 Applesauce is incredibly easy to make so if you have the dregs of your picked apples lying around, just beginning to turn (or not), throw this on the stove, sit back and enjoy the fruits of your minimal labor in just about 20 minutes. I made mine with apple cider to give it extra sweetness and spices, but you can just as easily use water, some brown sugar and spices like nutmeg and cinnamon. Serving Size= 6. Active time= about 8 minutes. Cook time= 20 minutes. 1) Peel, core and loosely chop the apples into about ½ inch pieces. If you want smooth applesauce, chop all pieces uniform size. If chunky applesauce is desired, chop ¼ of the apples in larger chunks (1 inch or larger). 2) Place apple pieces, cider and cinnamon stick into a small stock pot over medium high heat. Bring to a boil then lower heat to medium. Simmer, slightly uncovered 15-20 minutes until applesauce is at desired consistency. Enjoy warm or cooled. Check out other Fall Feast-ival items over at WellFed's FitFare! Tags: applesauce, apples, comfort food, fall food. There are few things that complement pork chops as well as apples. Pork chops with applesauce is standard fare. And after years of this mundane preparation, I had essentially sworn off pork chops. It was not until I met D, with his penchant for pork that I began to eat “the other white meat” and truly appreciate it. Over the years we have worked on our now standard pork chop recipe. Believe it or not, I clamor for it more often that D does these days. No sauce is used, but fresh apples-- All the better while they are in season and abundant. This fall, the recipe has truly reached perfection, braised in cider and rum, the result is sweet, moist meat with a sauce that deserves sopping. Pork chops are easy to ruin. Overcooking creates dry, gristly meat and is all too common. To braise a pork chop then, is to eradicate the fear of overcooking while providing a savory sauce to accompany your meat. This is a recipe I discussed previously. When D first made these chops, they were devoured in seconds. Again, D was in charge of the meat and I was happy sous chef to the operation. And again, I dare you not to devour these in seconds. I think to truly make this dish perfect would be to serve it on top a bed of polenta. This way, all juices can be appreciated and none lost. This dish is a fabulous seasonal dish, so make it post haste. Serving Size= 2. Active time= about 10 minutes. Braise time= 15 minutes. 2) In a deep oven-safe pan (or dutch oven) over high heat, warm butter and olive oil (to barely coat bottom of pan). 3) While pan is warming, prepare the pork chops: Wash and fully dry the meat. Coat evenly on both sides with cinnamon, cumin, coriander, salt and pepper. Carefully place meat in pan and sear both sides until thoroughly browned; about 4 minutes each side. This seals in the pork chop juices and allows you to properly continue the braising. Do not be afraid to really brown the chops in this step. 4) Remove the pork chops from pan and reduce heat to medium. Deglaze by adding rum and scraping bits that have stuck to the pan up and into the rum. Add cider and apples. Braise the apple wedges in the juices until they are limp and have absorbed some juice; about 4 minutes. 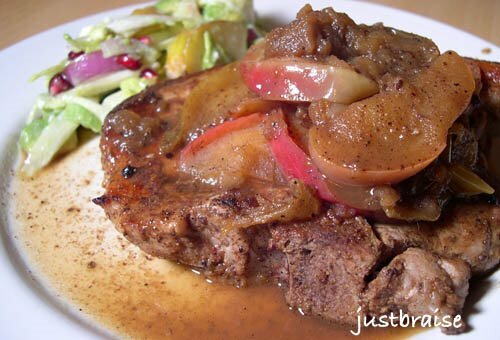 5) Return pork chops to pan and move apples around the meat to cover sides and top (some may remain under the chops). 6) Cover pan and place in oven for 10-15 minutes until pork chops are juicy and succulent and liquid has reduced and holds a sweet, thick aroma. Serve with the apples crowing the meat and the sauce all around. Delicious. Head on over to Sweetnick's for Tuesday's ARF round up! Tags: pork chops, pork, apples, comfort food, braise, ARF. Sweet, gooey, warm and crisp, there are few things that totally satisfy our child desires of yesteryear like a perfect butter-laced grilled cheese. I think the French understand this desire best—the croque monsieur and croque madame are practically the national foodstuffs. [And believe you me, any time I find myself in this tasty country (which is definitely not enough) I am always sure to pick up this café treat.] When I first came across the croque pair in my elementary French textbook I thought it was surely a mistake—that or the authors were pandering to the young masses that were learning the placement of all those accent egus. Why were we learning how to order a grilled cheese sandwich, a seemingly typical American food?! How wrong we were, not just in the fact that we all thought the grilled cheese as typical American, but our base preparation methods (on a dare might you use Swiss cheese over a cheddar or [gasp] American cheese!). So while it is hard to believe our fresh picked apple supply is barely beginning to dwindle (I won’t even go into how many batches of apple chips, have been produced), a gooey cheese sandwich seemed like a perfect pairing with some crisp juicy apples on a fall morning, mais non? And for the dear reader, yet another recipe to put those fall apples to good use. Serving Size= 2 sandwiches. Active time= about 15 minutes (less if bacon and mushrooms are already prepared). 1) In a hot frying pan, cook the bacon until desired crispness is reached. While bacon is frying, keep an eye on it and slice the mushrooms, onions and apples. 2) Once bacon is complete, transfer to paper towels, drain fat from pan, return the pan to the stovetop and on medium-high heat, sauté mushrooms and onions. While mushrooms and onions cook, prepare the bread. 3) On 2 slices of bread, spread an ample amount of roasted garlic paste (optional). 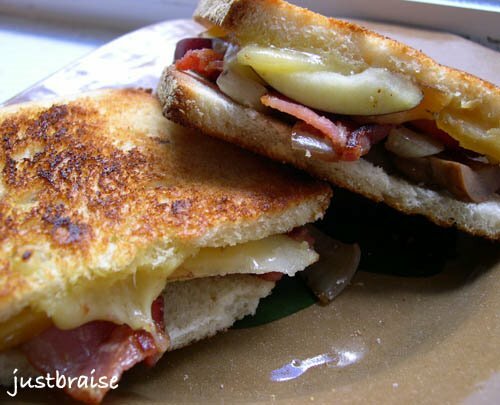 Cover bread with a layer of gruyere, a layer of sliced apples and 1-2 slices of bacon. Set aside. 4) Once mushrooms are browned and onions are translucent (about 8 minutes) transfer to a bowl and carefully wipe pan dry. 5) Turn heat to medium, melt ½ tablespoon of butter in the pan. Transfer prepared bread halves (with cheese, apples and bacon) onto the pan, top with mushroom-onion mixture, place second slice of bread over top and allow bread to brown and cheese to melt; about 4 minutes. Flip carefully, add ½ tablespoon butter to pan and move sandwiches around to pick up butter (allowing the butter to brown, not the bread to burn). Let sit about 3 minutes, remove from pan and eat hot and delicious. * roasted garlic paste is a cinch make (and cost effective if you’ll be roasting something else in the oven). Simply take a whole head of garlic and slice the top off clean (to barely give you access to the cloves). Wrap in tin foil and place in the oven (around 350F) for 30-45 minutes. Remove and let cool. Once cool, pop the garlic cloves from their shells and transfer to a small dish. Add about 3 tablespoons olive oil and stir to breakdown garlic and incorporate olive oil into a uniform paste. Great on sandwiches, over meat, in potatoes or mixed into a salad dressing. Tags: grilled cheese, apple, gruyere, fall food, apple picking, sandwiches. Many may think we leave it to the wisdom and foresight of Johnny Appleseed to spread the goodness of apple orchards throughout the United States. While Johnny can be accredited to spreading the seeds, few of the apples that came to be would ever be worthy of eating fresh picked. Edible apples, rather those sweet enough to make it into our lunch sacks or slathered with peanut butter, need splicing to reproduce. Meaning the Red Delicious we eat today is very much a piece of the original Red Delicious tree first produced (not a seed descendent). Planting seeds of apples produce 10 very different fruit trees, more than likely none of which will be as sweet as the original. The short of the long of it, our dear Johnny enjoyed knocking back a few in his day and thought it best to spread the good cheer throughout the land. Spreading seeds of apples, and therefore many a tart variety, led to a massive production of cider (the hard kind). Unfortunately, due to Prohibition, many of the orchards that Johnny is accredited with helping along were chopped down. On the flipside, clearing the bitter orchards very well may have led to space for the cherished sweet varietals we know and love today (my current favorite is the new Honeycrisp-- crisp, juicy and tastes like honey mixed into apple cider). Serving Size= 10-12 servings. Active time= about 15 minutes. Cook time= 1-¼ hours. 1) Preheat oven to 350°. Spray a 12-cup bundt pan with cooking spray [or butter]; set aside. 2) Working over a large sheet of parchment paper, sift together flour, cinnamon,[allspice and ground ginger] baking soda, and salt; gather sifted ingredients into center of sheet; set aside. 3) In the bowl of an electric mixer fitted with the paddle attachment, combine vegetable oil, sugar, and eggs; mix on high speed until lemon yellow. 4) Fold reserved parchment in half lengthwise; with mixer on medium speed, gradually shake in dry ingredients until just incorporated. 5) Add apples and, if desired, nuts, to batter; mix to combine [using the electric beater. The juice from the apples will escape a little as they break down and loosen the batter]. Add vanilla, mixing until incorporated. 6) Pour batter into prepared pan, and bake until a cake tester inserted in the center comes out clean, 75 to 90 minutes. 7) Remove from oven, and cool slightly on a wire rack. 8) Invert cake onto rack; turn cake right-side up to cool completely on rack; serve with whipped cream, ice cream or plain. This past weekend, surrounded by mountains screaming color, D and I headed upstate with some friends to camp. As we have learned from past fall foliage camping years, no trip in the creeping fall days is complete without some apple picking (as well as apple cider and apple donuts). We ate more than our fill, testing the varietal that would win our hearts and make it into our oversized ½ peck to return to the city. We picked rotten ones from the ground and threw them into the high reaches of trees, attempting to knock loose a prized specimen. We made running high jumps into the branches grasping a seemingly perfect morsel—only to have hopes dashed and eyes splashed with rotten juices. And in the over exuberance of finding a tree of Red Delicious full of fruit, we even came branch to arm with a healthy dose of poison ivy (though none has broken through yet, fingers crossed). There are few things that feel more fall or are as delicious as a freshly picked apple. And there are few things more rewarding than admiring one’s gathering skills with a bushel of rubies stacked high in the kitchen. My third grade teacher is what we used to refer to as a “nature freak.” Strange for us suburban kids to find someone so caught up in nature— she once yelled at a classmate of mine because the girl stepped on an ant—“how would you like to be that ant? !” Well, it’s dead now, so we wouldn’t thank you. But there were some great teachings, most now forgotten, that lay between Pioneer Days (where we dressed like Little House in the Prairie, went to a neighboring school, “hunted” and ate venison stew, churned butter and home schooled our “children”), candle making and Apple Days (where we went apple picking and sat for 2 days peeling, chopping and slicing apples for apple sauce and strung ribbons of apple slices that dried into apple chips in our windows). So this morning as I looked to our fresh apples I remembered the apple chips. And even faster than stringing them into the window waiting two weeks for them to dry, is the almost instant gratification of drying them in the oven, low and slow until crisp and delicious. Serving Size= about 60 chips. Active time= about 20 minutes w/ a Cuisinart or other slicer, more if slicing by hand. Cook time= 2 to 2-¼ hours. * assorted spices depending on flavor desired (lime juice-cumin-curry, cinnamon-sugar, salted or plain are all delicious). 1) Set oven racks on bottom and top quarter of the oven. Preheat to 225F. Line baking sheets with parchment paper and dust each with powdered sugar. 2) Line sheets with apples, do not overlap apples or they will stick together. 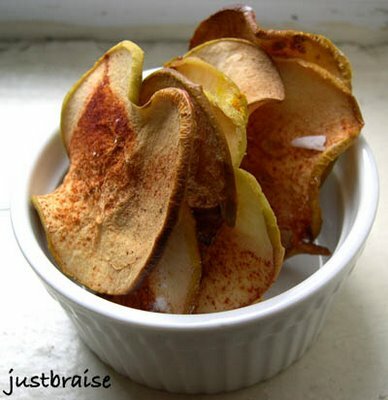 3) Dust top of apples with selected spice combination. 4) Place one sheet on top rack, one on bottom and back for 2- 2-¼ hours, until apples are golden. Rotate bake sheets half way through cooking and remove apples immediately from sheets onto a cooling rack once out of the oven. NOTE: Serve as a snack (like regular potato chips) or as a side to sadwiches, on top of ice cream or other creamy fall dessert, in a salad, with pork chops or whatever else you can imagine. 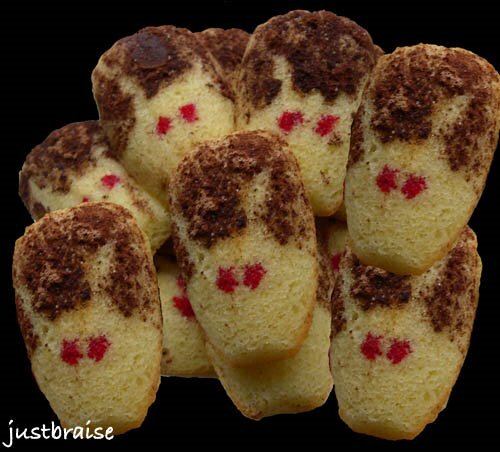 Head over to Sweetnick's for today's ARF round up! You can catch some book reviews here, here and here*. *Note: These reviews have all appeared previously on the WellFed Network.